Artist Adam Normandin will present his large-format oil and acrylic paintings at Conversations 2017, held at Lake Forest College April 28 through 30. Boundless—2015, 48 x 144 in., oil and acrylic on canvas—features New York Central 4-8-2 no. 2931, a class L-2d “Mohawk” steam locomotive. 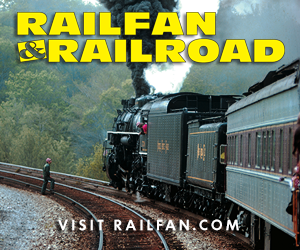 Founded in 1997 the Center for Railroad Photography & Art works with photographers, writers, and historians around the world to offer a new and unprecedented view of the railroad’s influence on American culture through the preservation and presentation of art and photography. Since the beginning, the Center’s goal has been to offer high-quality public programs associated with photography and art works in all media. These programs have included successful traveling exhibitions displayed around the country, as well as our own annual creative photography award contest. The annual “Conversations” conference sets the pace for discussion about contemporary railroad photography and encourages young photographers to become a part of the community. Conversation 2017 will be held on the campus of Lake Forest College in suburban Lake Forest, Ill., April 28 through 30, 2017. Here is a sampling of some of the work from this year’s presenters. 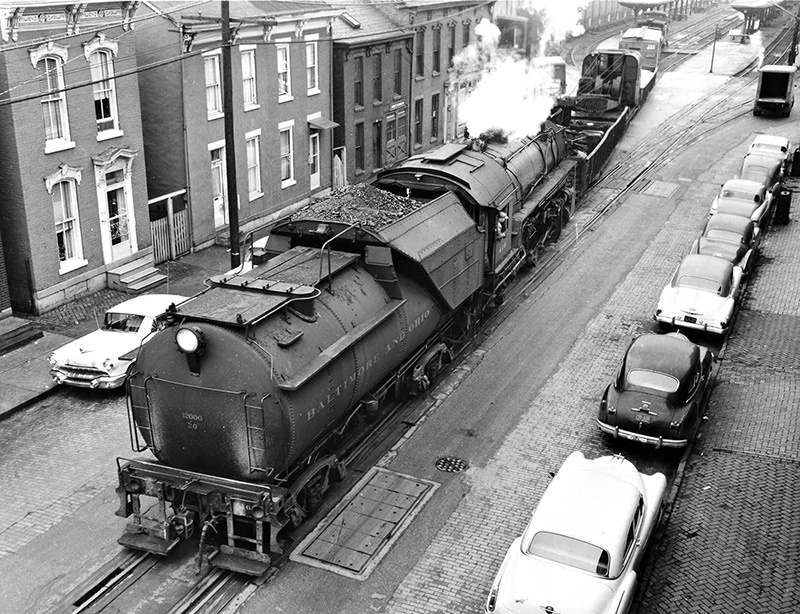 The legendary J.J. Young’s photography is the subject of a new book by Nick Fry, curator of the Barriger National Railroad Library in St. Louis. In this view, Baltimore & Ohio Q-4b Mikado no. 416 is backing a train through Wheeling, W. Va., station trackage onto Seventeenth Street en route to Tunnel no. 1 to do excavating work in 1957. 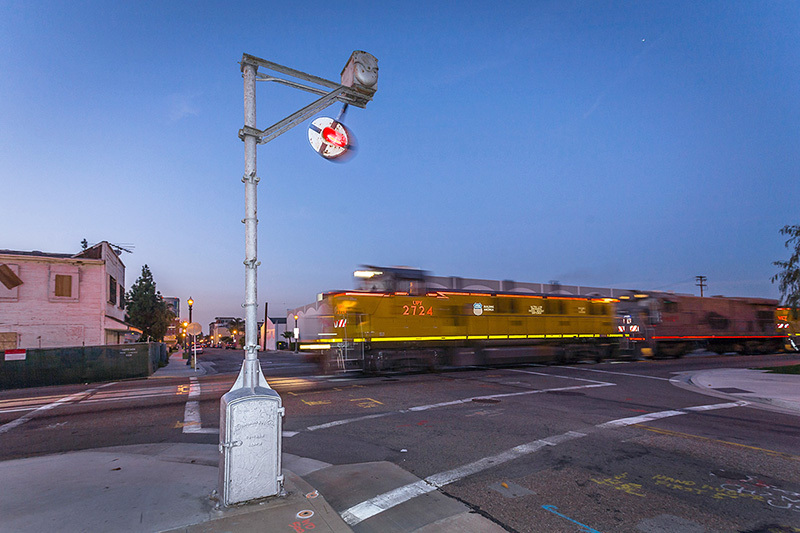 Union Pacific train LOA31R, the Marlboro Local, having worked what remains of the former Tustin Branch returns to Anaheim, Calif. along Santa Ana Street where an ancient Magnetic Flagman continues to provide protection against automobile traffic at Lemon Street, on February 28, 2008. The granger country photographs of Russell Lee and Esther Bubley are the topic of a new book by presenter James J. Reisdorff, who will be joined on stage by Jean Bubley, Esther’s niece. 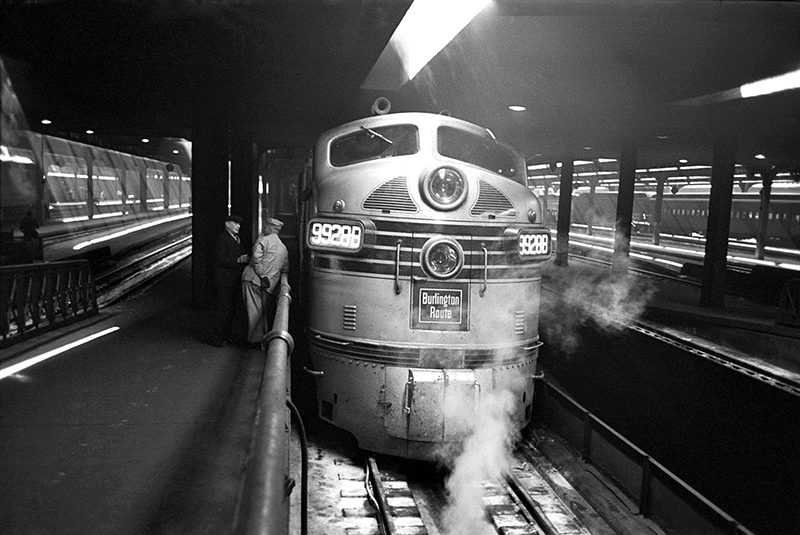 In this 1948 view by Esther Bubley, a Burlington passenger train is arriving at Chicago Union Station in 1948. 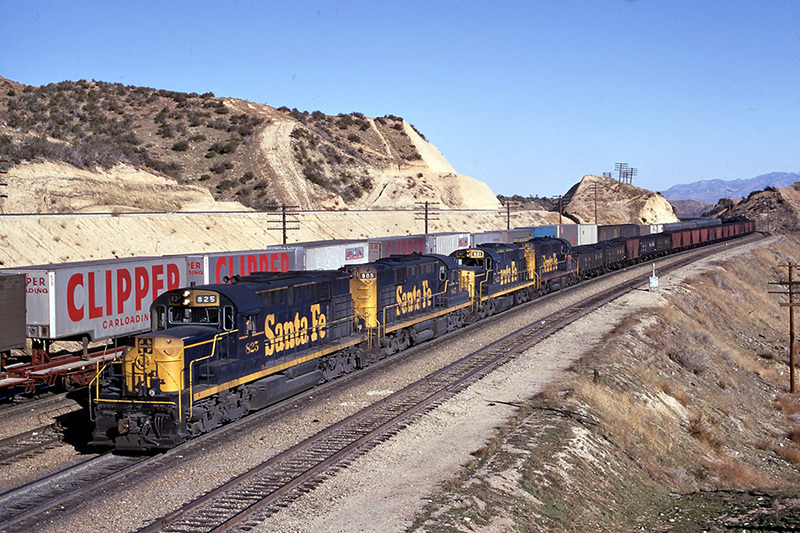 A quarter of Santa Fe RSD15 “Alligator” locomotives, led by no. 825, bring a westbound coal train from York Canyon, N.M., over the summit of California’s Cajon Pass on December 30, 1967. 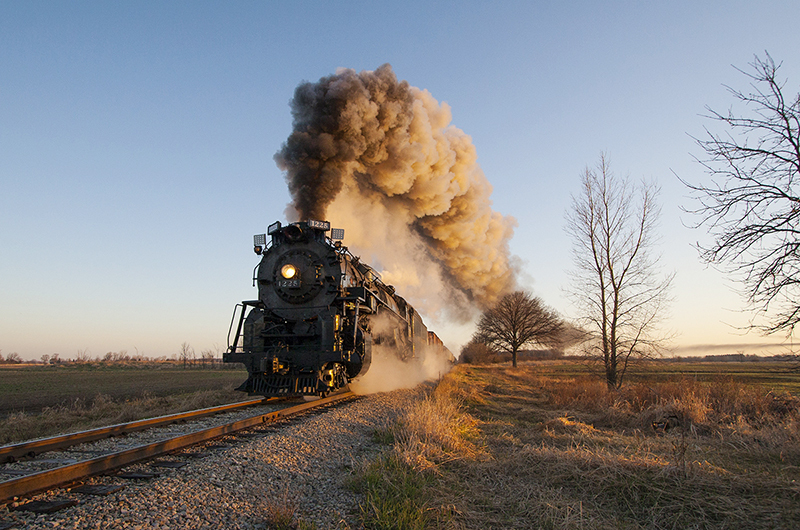 Photographer Alan Miller’s pursuit of trains has taken him all over the world. Take a ride on the Milwaukee Road’s “Beer Line” through the research of John P. Kelly and the photographs of Wally Abbey. Kelly will be on hand to sell and sign his book Railroads of Milwaukee. 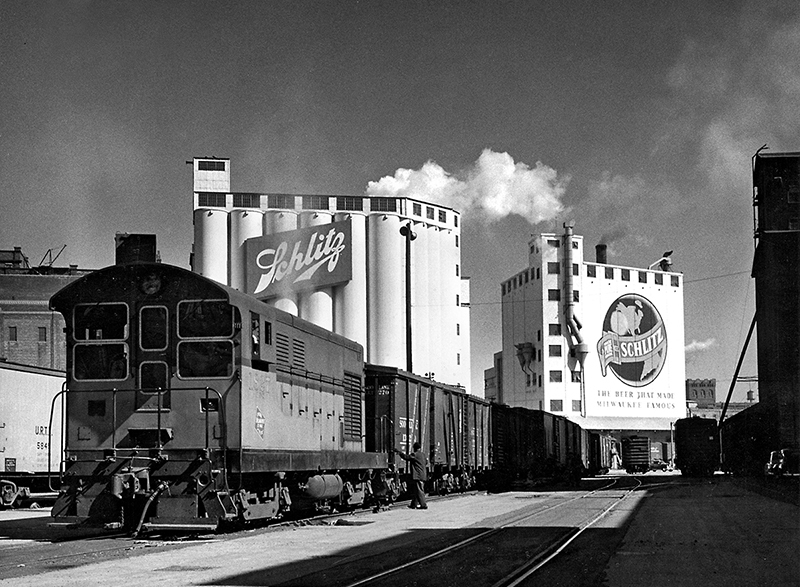 In this view from 1951, a Milwaukee Road Fairbanks-Morse diesel switches the Schlitz Brewery. Photograph by Wallace W. Abbey, collection of the Center for Railroad Photography & Art. 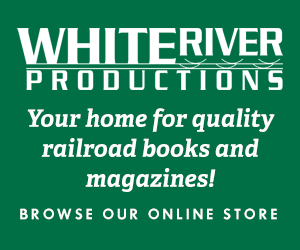 The new book Twelve Twenty-Five: The Life and Times of a Steam Locomotive will be available for sale, and author Kevin P. Keefe will be on hand for signings. An 11×14 print of Jeff Mast’s cover photograph will be the prize for Friday night’s raffle drawing. J.B. Jackson, a landscape geographer who taught at Harvard and UC Berkeley, had a profound impact on landscapes studies and even railroad photography. Alexander Benjamin Craghead will share Jackson’s work and impact in his presentation, “Which Way to Look? 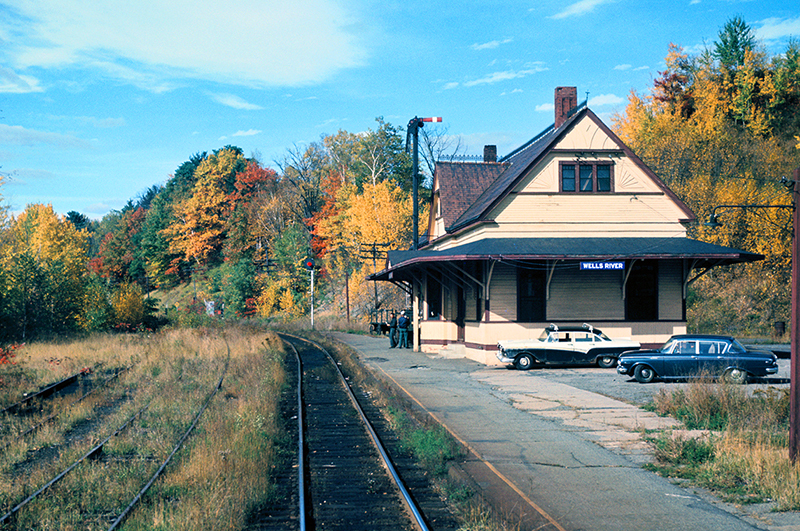 Railroad Photography After J.B. Jackson.” This slide by Jackson captures his interest in the small town depot, in this case Boston & Maine’s at Wells River, Vt., long after regular passenger service had ended. 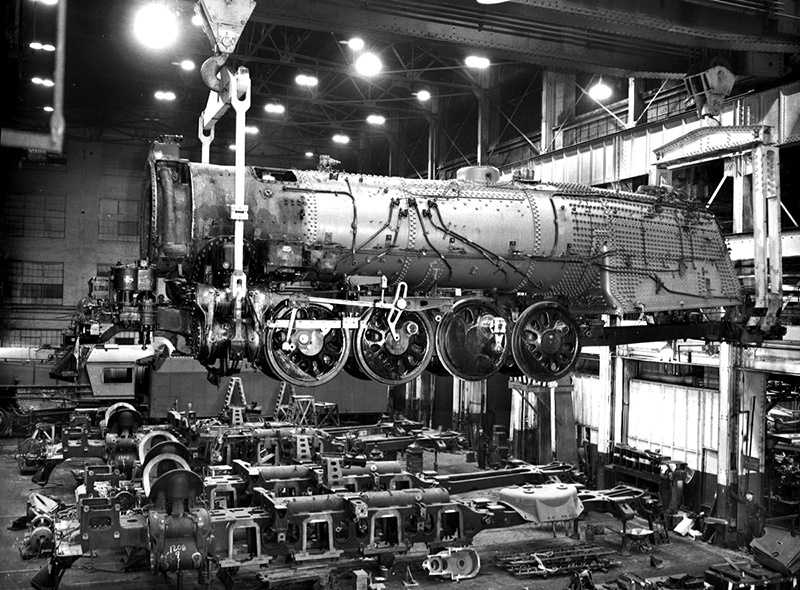 Eric Hirsimaki will discuss the art of the locomotive portrait in his presentation, “Photography at the Lima Locomotive Works.” This view shows the works’ overhead crane in Lima, Ohio, lifting a Louisville & Nashville 2-8-4 steam locomotive in 1949. Photograph by Donald C. Jardine. 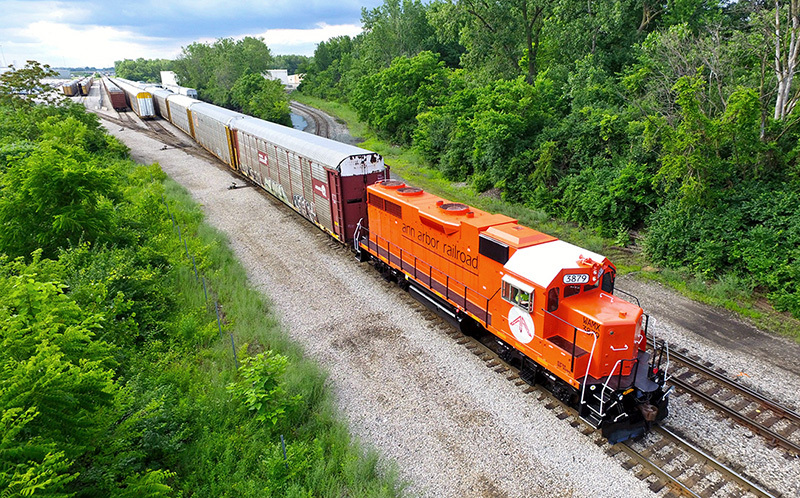 WATCO’s Ann Arbor Railroad GP38-2 no. 3879 in heritage paint at Toledo, Ohio, on July 28, 2015. Photograph by conference presenter Drayton Blackgrove, who turned his passion for railroad videos into a successful business, Delay in Block Productions. Katherine Botkin married a railroad photographer (past conference presenter Bill Botkin) but soon made the pursuit her own, an experience she will share in, “Marrying into Railroad Photography.” This photograph shows Denver & Rio Grande Western no. 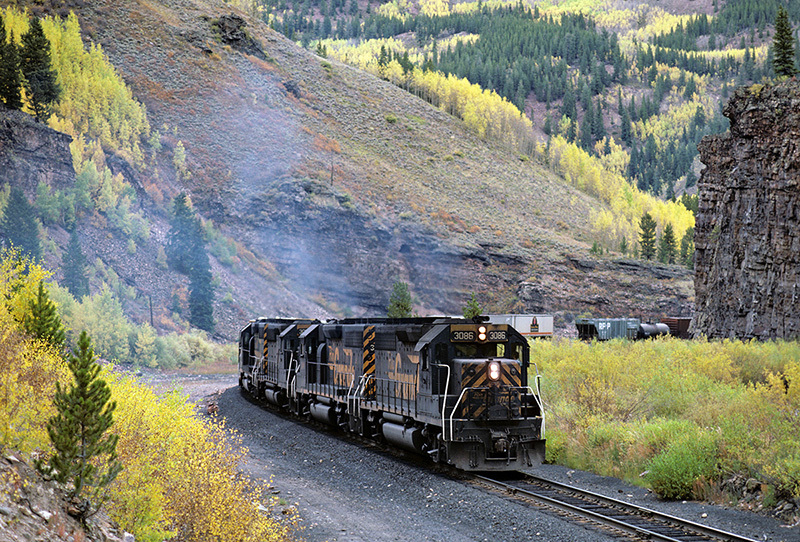 3086 leading a freight train over Tennessee Pass at Pando, Colo., on September 20, 1986. 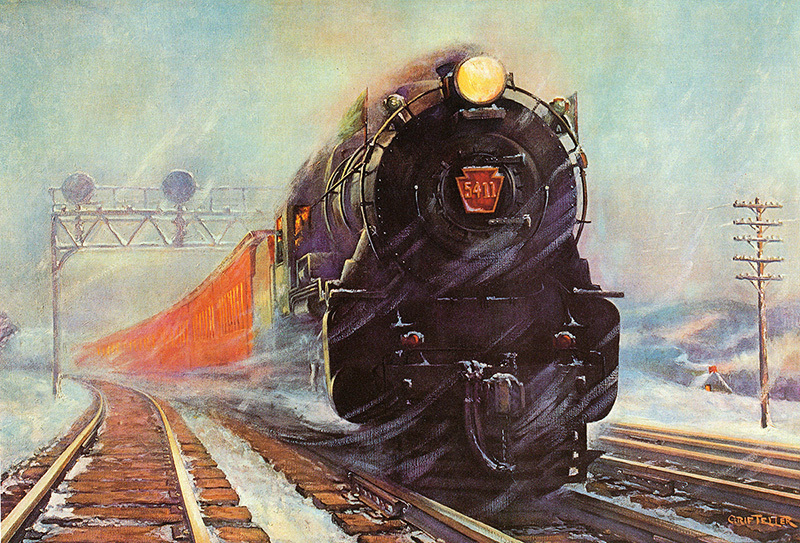 Grif Teller (1899-1993) was a renowned painter known for his dramatic portrayals of the Pennsylvania Railroad between 1928 and 1959. This one, from 1932, was titled simply, On Time. Dan Cupper will present several of Teller’s colorful works in his presentation. For more details about Conversations 2017 and other important programs, please visit the Center for Railroad Photography & Art’s web site at www.railphoto-art.org/conferences/conversations-2017.